Uply Media, Inc tailors dating app targeting market-share for fastest growing legal business in America. ATLANTA - April 28, 2016 - PRLog -- Cannabis is now the fastest growing illegal to legalized business in the United States. Uply Media, Inc today announced that 420Dates app is the #1 "Cannabis Dating App" for iPhone on Apple's App Store in the U.S.A. The niche dating app raises support for cannabis healthy lifestyle and advancements. Not only is 420Dates app rated on Apple's top charts for iPhone in the United States at number one for cannabis dating app, the dating app also holds the number one position for "cannabis dating apps" overall for iPhone in the U.S. inside the App Store as well. 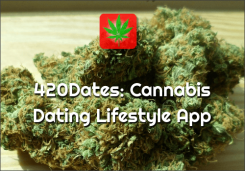 Additionally, 420Dates app is ranked number one for "cannabis lifestyle" followed by MERRY JANE the media platform for sophisticated cannabis culture. Kyle Ransom, CEO of Uply Media, Inc expresses excitement for how well the app is doing since only being released in February of 2016 and the ability to utilize research data to implement lifestyle awareness. Ransom says what 420Dates offers to dating apps for iPhone is a niche lifestyle connection. He says more dating apps will start to invest in this area and that Uply Media, Inc is already a leader when it comes to niche dating apps with a diverse portfolio of these kinds of apps in both Apple's App Store and Google Play Store. To date Uply Media, Inc has remarkably managed to build a profitable startup business model without accepting any outside VC venture capital funding. While many startups owe multi-millions to venture capital firms. Ransom says they decided to go against this model and even Shark Tank investment fame. He says that Uply Media, Inc likes the path of Markus Frind who at only 36 was the founder and CEO of Vancouver-based Plenty of Fish sold his company to Match Group for $575 million in cash not owing a single VC firm. Uply Media, Inc now competes with Match Group an IAC/ InterActive subsidiary who operates as a public company. The niche dating app Cougar Hookups is the number one app for iPhone in the U.S. for "Hookups" even ranking over Match Group's Tinder dating app for hookups searches in the App Store. Ransom reveals that he had no idea about this advantage in the app marketplace until a reporter in another country called him and told him the good news. Currently, 420Dates is only available on the App Store and for download at no charge. However, app users must be at least 17 years old to download the app. To download requires iOS 8.0 or later and is compatible with iPhone, iPad, and iPod touch. The languages include English, Dutch, French, German, Hebrew, Italian, Polish, Portuguese, Romanian, Russian, Simplified Chinese, Spanish, Traditional Chinese, and Turkish. The primary category for 420Dates app is "Entertainment" also a popular category selection in the App Store for Netflix, HBO Now, Kylie Jenner and the Kardashian crew. To become a sponsor partner for marketing and promotions with apps owned and operated by Uply Media, Inc please contact info@uplymedia.com or call (404) 806- 0548 .